Oct 31: Today, former U.S. Vice President Walter Mondale made official his support for Diane Hofstede's re-election to the 3rd Ward Minneapolis City Council seat. 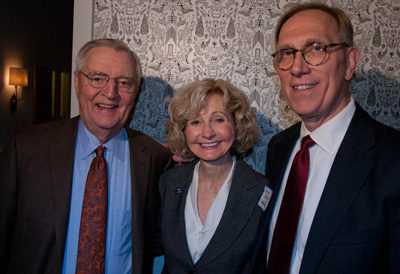 Mondale and his wife, Joan, are longtime supporters of Hofstede. Today he shared a letter of support for her re-election. 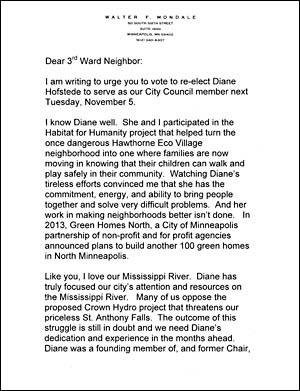 The letter addresses Hofstede's track record of success, including her work to build safe and affordable housing in Hawthorne EcoVillage and through Green Homes North; her strong opposition to the proposed Crown Hydro development; and her leadership to create access and green spaces along the riverfront in North and Northeast Minneapolis. "The Third Ward is a thriving community and Joan and I are proud to call it our home," Mondale said, in his support letter. "I am keenly aware that the success of our city and our future of success is not a small task. It takes leadership, experience, and a desire to make government work, despite obstacles, and differences of opinions. That is what Diane Hofstede gives us every day and that is why she has our wholehearted support." 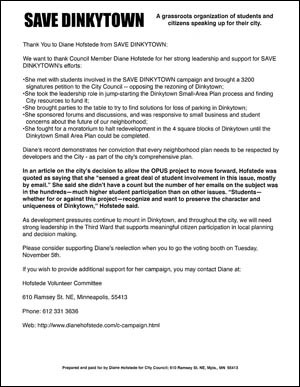 She fought for a moratorium to halt redevelopment in the 4 square-blocks of Dinkytown until the Dinkytown Small Area Plan could be completed. 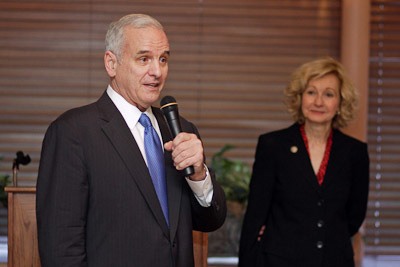 Minneapolis, MN: At a large fund-raiser event last night at The Bachelor Farmer in Minneapolis, both Governor Mark Dayton and former Vice President Walter Mondale fully endorsed Diane Hofstede for re-election to the Minneapolis City Council, to represent the Third Ward for a third term. As Governor Dayton was not in attendance due to his sudden hip surgery, Vice President Walter Mondale hosted the event." "I've worked with Diane Hofstede on a number of issues. What I have seen is her public service of honesty, integrity, boundless energy and a fierce dedication to the needs of the people and neighborhoods she represents. 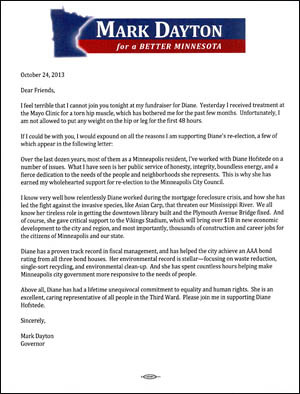 This is why she has earned my wholehearted support for re-election to the Minneapolis City Council." The Governor went on to say: "Diane has a proven track record in fiscal management …Her environmental record is stellar…And she has spent countless hours helping make Minneapolis city government more responsive to the needs of people. In conclusion the Governor notes that "Diane has spent countless hours helping make Minneapolis city government more responsive to the needs of people. Above all, Diane has had a lifetime unequivocal commitment to equality and human rights. She is an excellent, caring representative of all people in the Third Ward. Please join me in supporting Diane Hofstede." Vice President Mondale said last night "…you can't say it any better than that! Diane is an outstanding public servant and deserves re-election." 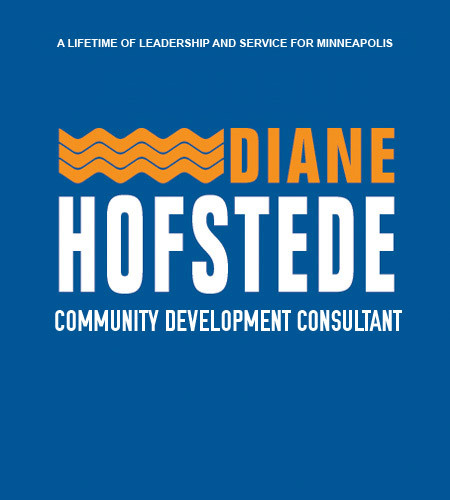 Oct 4th: The East African/Somali Community Leadership Endorses Diane Hofstede: Supported by business, residents, women's and religious leaders for the Somali/East African communities. 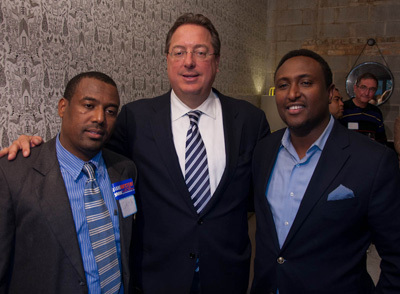 "The Somali Leaders of the East African Community endorse Diane Hofstede as our Third Ward City Council Member. We endorse her for her vision for our future and her record of inclusion of our community in the Third Ward. She has supported us, and worked with us to improve our lives in the areas we care about: improved public safety, community meeting with us and for our concerns. She has worked with the Minneapolis Parks to increase programs at our parks for our children, and she has gone above and beyond the work of a city council member for us. She is who we are voting for as our Third Ward Council Member. Diane has earned our support!!!" 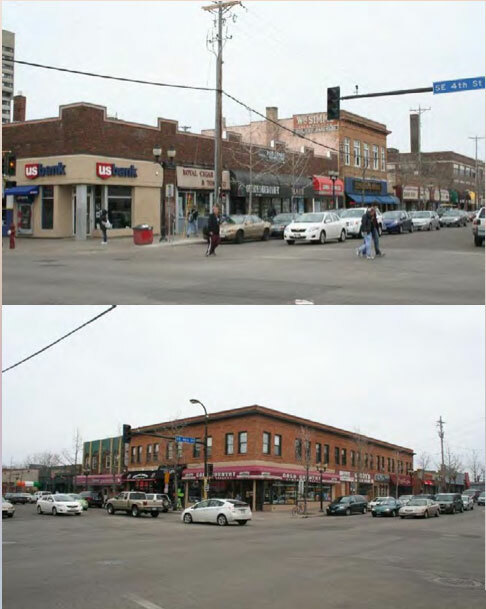 Sept 3rd: "City Allows More Apartments in Dinkytown" (MN Daily) Minneapolis City Council Member Diane Hofstede speaks in favor of a Dinkytown development moratorium Friday morning at Minneapolis City Hall. The moratorium would block Kelly Doran's proposed six-story, mixed-use apartment complex in the heart of Dinkytown. Pack & Give Back is a unique collaboration between the university, City and County staff, residents, and local non-profits that addresses the issue of excessive garbage being left behind by outgoing tenants. The program is the result of a work group started by City Council Member Diane Hofstede, which includes City Solid Waste and Recycling and Regulatory Services, the University of Minnesota District Neighborhoods residents, students, rental property owners, Dinkytown businesses, Hennepin County, the University of Minnesota, and non-profit organizations. See also MN Daily article from April 7th. 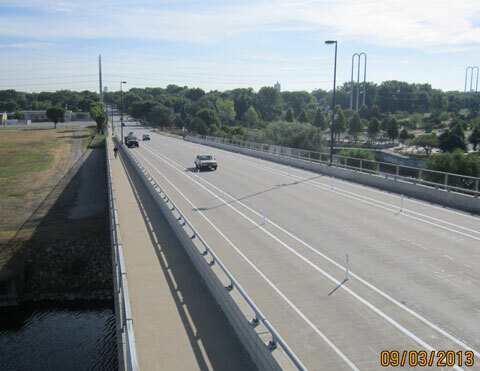 The Minneapolis Park and Recreation Board (MPRB) seeks community input on plans to improve 3.5 miles of bicycle and pedestrian trails and related amenities along the west bank of the Mississippi River from Franklin Avenue to Plymouth Avenue in Minneapolis. A community survey and series of community meetings are planned: Sept. 3, Sept 24, Oct 15: 6:30-8:30 pm, MPRB Headquarters Board Room, 2117 West River Road. August 15th: Mayor Rybak's 2013 Budget Address Validates Work of Diane Hofstede Over the Past 8 years. A decade ago, we faced a set of problems that seemed insurmountable: but one by one, we have tackled them, despite two recessions and a never-ending fiscal crisis at the State. Paying down debt: $241 million. Reforming closed pensions: in 2011, the last of these pensions were finally merged with the State's PERA system. Partnering with employees: we have worked together to make cost-saving reforms to employee health care without sacrificing quality, and we have agreed to hold all of our salaries in check, which has allowed us to save jobs and hold down the growth of property taxes. Target Center Property Tax Burden Alleviated: through the actions of Council members Johnson, Hofstede and 5 others, $5 million/year is being saved. Watching Our Spending: while the state has spent 30% more over the past decade, Minneapolis spending only increased 4% (at the expense of 12% fewer full-time public servants in city government). Reforming Service Delivery: Merging Libraries; Staffing for Snowplowing; Creating 311. 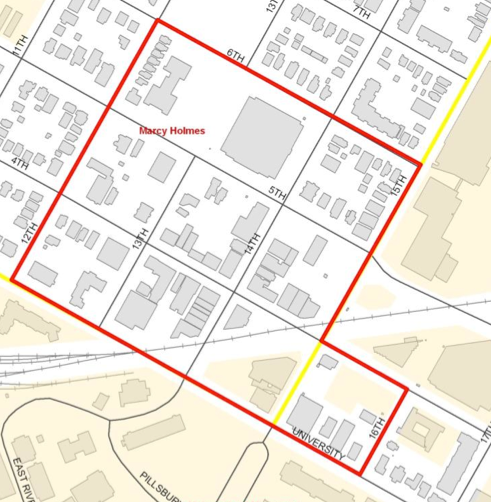 The Minneapolis City Council on August 2 rezoned a portion of Dinkytown to pave the way for a mixed-use apartment and commercial building that displaces the House of Hanson and other long-time businesses on Fifth Street Southeast between 13th and 14th avenues. Third Ward City Council Member Diane Hofstede, who represents the neighborhood, tried to block the rezoning. The zoning and planning committee had voted against the rezoning a week earlier, and the Council vote was a rare rejection of a committee recommendation. Four council members voted for Hofstede's substitute motion to reject the rezoning, and the vote for Council Member Gary Schiff's motion to approve was 9-4 with Council Members Hofstede, Meg Tuthill, Cam Gordon and Lisa Goodman voting against the rezoning. 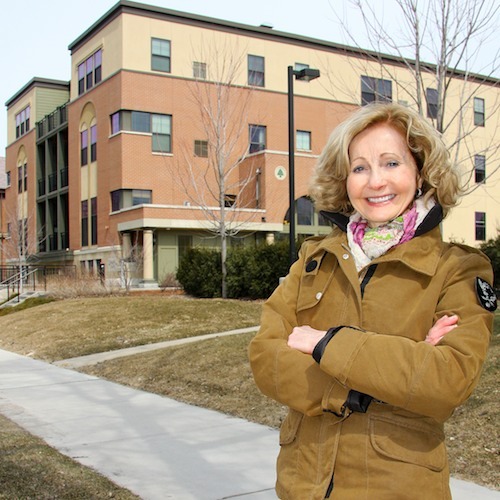 In discussing her motion, Hofstede proposed a moratorium on development in Dinkytown until a small-area plan is completed. Congratulations to you for undertaking the RiverFirst project and acknowledging the importance of the 13-mile stretch of one of the three greatest rivers in the world, the Mississippi River. The selected 13-mile-long riverfront is a unique opportunity in our city to focus our attention to the birthplace of Minneapolis. It is an opportunity to acknowledge the historic importance to our region. It is an opportunity to preserve and improve the ecological and environmental systems. It is an opportunity to connect our rich past and our future by sensibly acknowledging that not all existing structures need to be included in our preservation efforts.